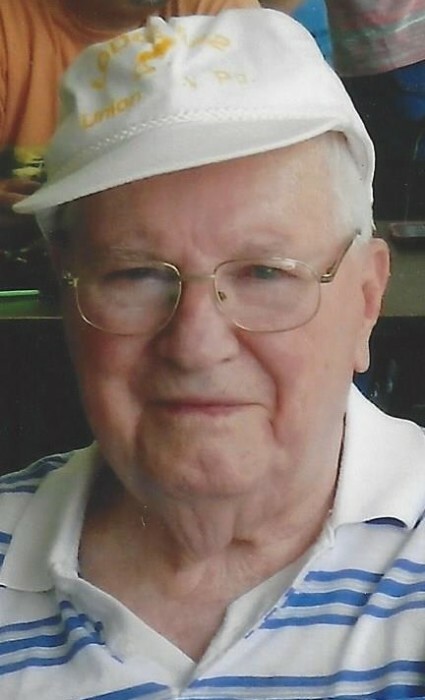 Milton "Mick" C. Parker, 95, of Wattsburg, died August 23, 2017, at Corry Manor. Born November 12, 1921, in Wattsburg. He was the son of the late Lynn and Mildred (Wright) Parker and the husband of Dorothy (Orlecky) Parker. He retired as a steward from Moose Lodge 882 of Union City. Milton was a life-long member of American Legion Post 237 of Union City, VFW Post 264 of Corry and Moose Lodge 882 of Union City. He was very proud of his military service to his country during WWII having served with the 99th Infantry Division (Checkerboard) in the Battle of the Bulge. Milton enjoyed woodworking in his spare time. In addition to his beloved wife of 58 years, he is survived by a step-daughter, Donna Kennedy and husband, Brian, of Union City; grandchildren, Melissa Kennedy and partner, Brooke Wenger and Darren Kennedy and wife, Amber; great grandchildren, Braelyn Kennedy Wenger and Carly Kennedy. In addition to his parents, he was preceded in death by brothers Warren and Arlyn and sisters, Verna Wyman and Shirley Drissel. Family and friends will be received Saturday at the Michael S. Pandolph Funeral Home, Union City, from 2 until the hour of service at 4:30 with the Rev. Rob Willert officiating. Interment will be in Wattsburg Cemetery. Memorial contributions may be sent to Wattsburg Hose Company 14415 Main Street, Wattsburg, PA 16442.